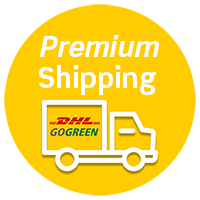 We send our orders exclusively as insured parcels using DHL. After dispatch you will receive an E-mail from us with the DHL tracking number and can track your order status. We charge only €3,50 for shipping within Germany. If you would like to pay via cash on delivery, further charges will apply. For items that are marked as bulky goods we have to charge a fee of 20€. Depending on the order value we have to charge for the higher package insurance and special customs processing.